It’s been well over a week since Ryan and I returned from California and I am still processing the whole trip. Sacramento, the California International Marathon, and Yosemite National Park all exceeded my (high) expectations. Even though we only spent six short hours in Yosemite, it quickly became one of our favorite national parks. Yosemite had long occupied a spot on my list of must-see places in the world. I grew up with photos of Yosemite around my childhood house, since my parents traveled together when they were a young married couple. Once Ryan and I moved out to Seattle and therefore closer to California, Yosemite became even more of a travel priority. So when I realized Sacramento was only a few hours from Yosemite, we decided to extend our trip and visit one of our nation’s finest parks. We opted to stay just outside of Yosemite, in a little town called Sonora, for multiple reasons: closer to the airport, less expensive, and a back-up in case parts of the park were closed due to snow. Honestly, we weren’t sure what type of weather to expect in December, especially since early forecasts called for a snowy winter along the West Coast. 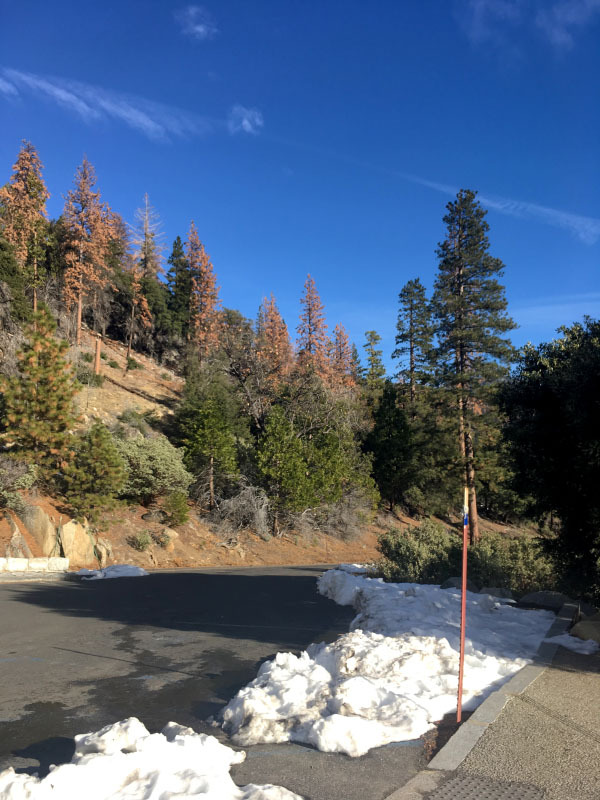 The drive from Sonora was approximately 90 minutes from the western entrance of the park, but the drive flew by thanks to the scenery as we wove through mountains, canyons, and the Stanislaus National Forest. 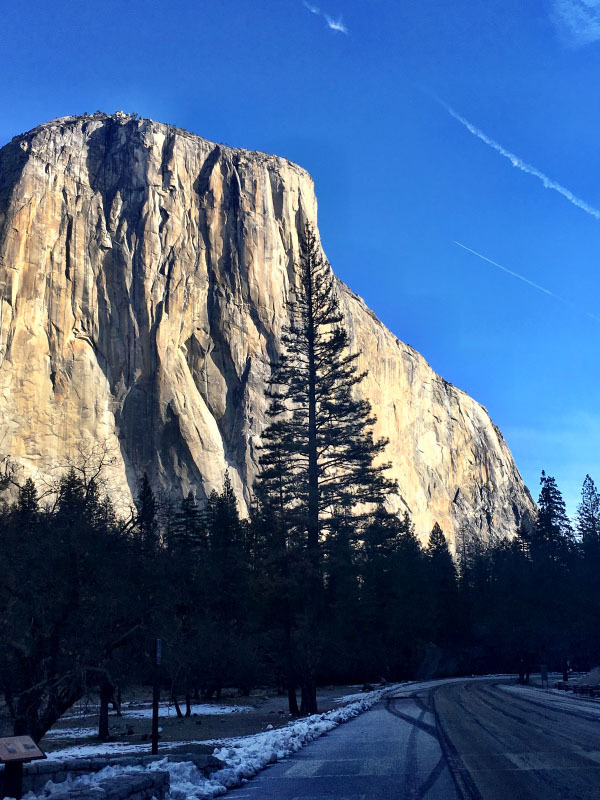 December is one of the lowest visitor months at Yosemite National Park. Some portions of the park were already closed when we arrived, such as Tioga Pass. We spend all of our time in Yosemite Valley, which already had a few inches of snow. 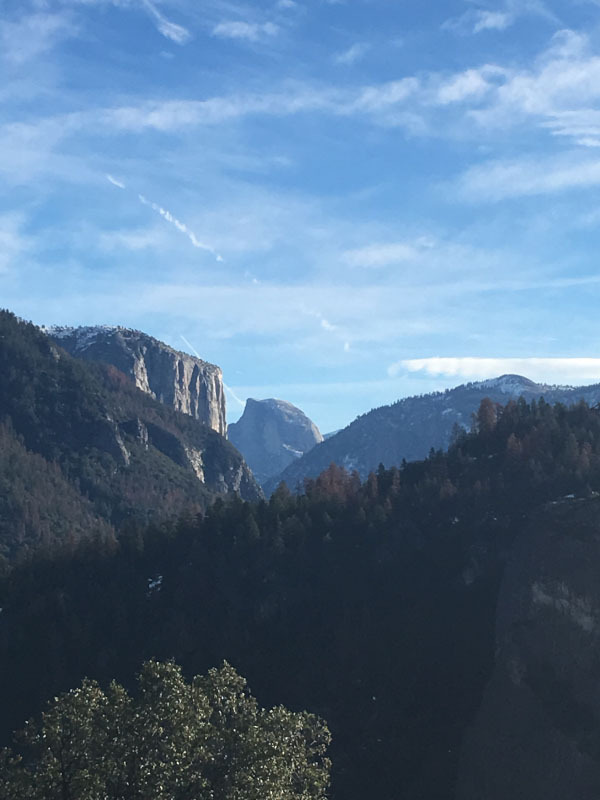 After we entered Yosemite National Park, we were shortly rewarded with some of the park’s famous views: El Capitan, Cathedral Rock, and Half Dome. No photo truly reveals the sublimity of these mountains. As we approached the Valley, we stopped several times for photos. We’ve seen plenty of mountains, but no mountains compared to these. In the Romantic/Gothic literature sense of the word, these mountains were awful: they inspired a sense of reverence, awe, and even a bit of humbling fear with their sheer ledges and cliffs. I felt extraordinarily small in their midst, not just compared to their size, but when I contemplated the millions who have stood in the shadows of these mountains, gaping at them as I did in that moment. Since we were in Yosemite one day after I ran the California International Marathon, I knew my legs didn’t have much in terms of hiking in them. My quads ached from the downhill and I had that post-marathon hobble for all of Sunday. 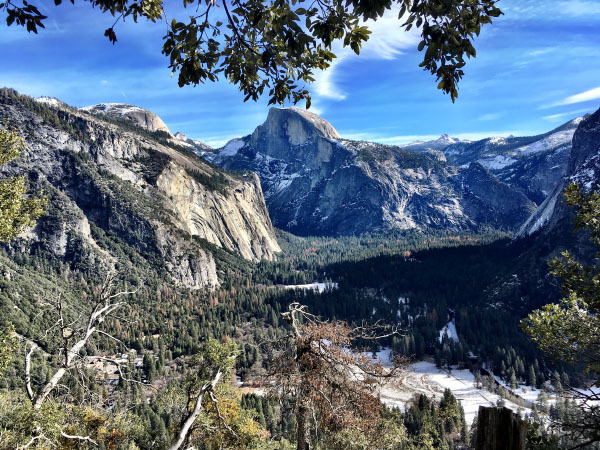 But when in Yosemite…you can’t say no to hiking! 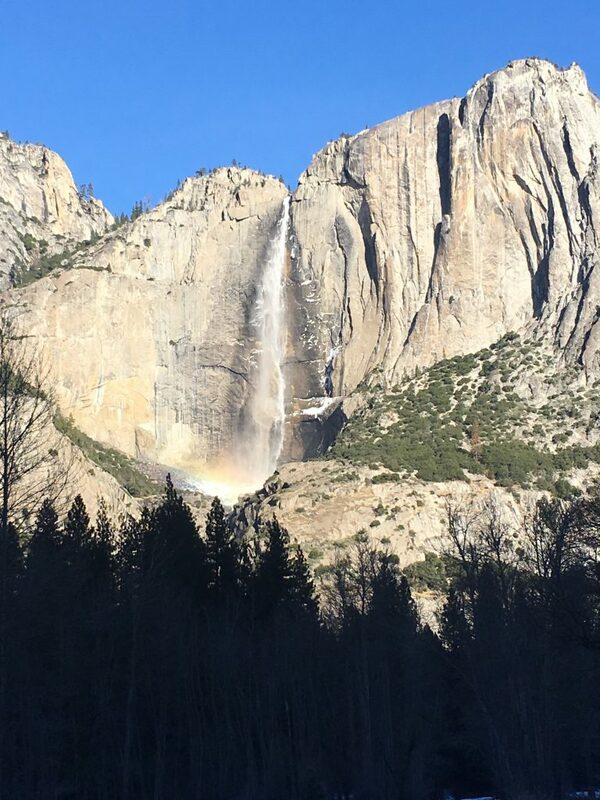 Jesica recommended the Upper Yosemite Falls and Lower Yosemite Falls trails, although she did caution about the steep incline of the Upper Yosemite Falls. 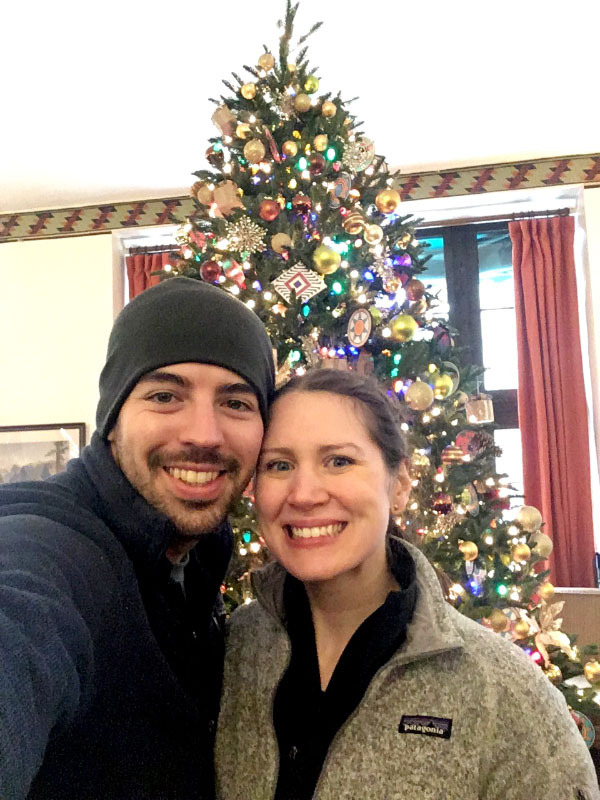 Still, Ryan and I opted for that one – we couldn’t resist it – with the caveat that we would only go as far as I felt comfortable doing. 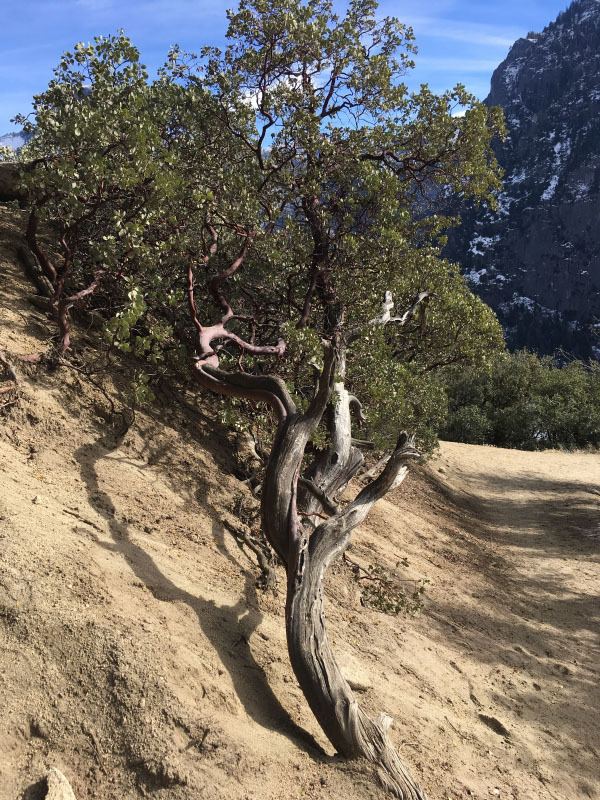 We started at a snow-covered Camp 4 in the Yosemite Valley (4000 feet elevation), but within a few hundred meters of hiking we were out of the snow. 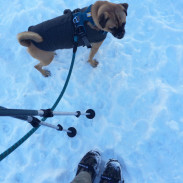 I really appreciated this, because even though I usually love snowy hikes, I needed steady terrain with my shaky post-marathon legs! We kept our hike short, although not easy with 1000 feet of climbing over 1 mile. We hiked along the Upper Yosemite Falls trail to the Columbia Rock look out, which was 1 mile from the trailhead. 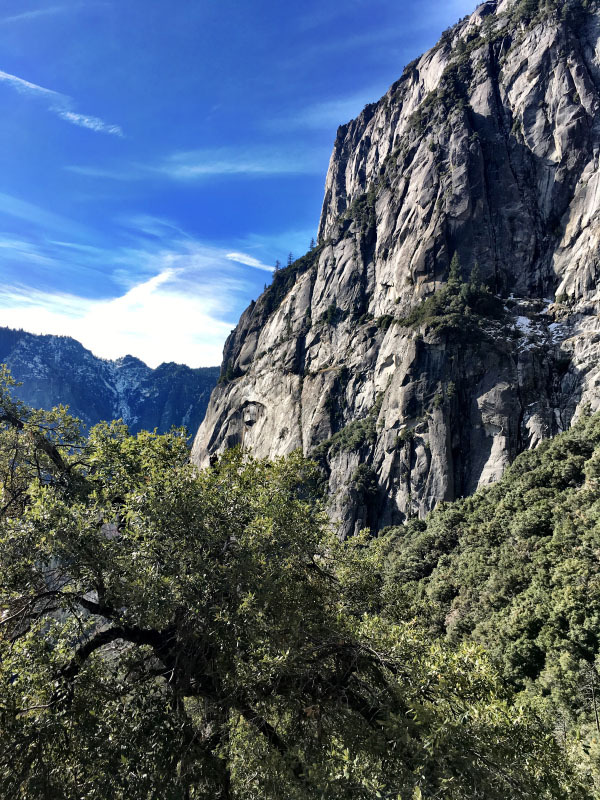 We spent 45 minutes hiking to Columbia rock, although we stopped every few minutes to admire the view of the Yosemite Valley (and let my legs rest). Downhill was a different story. 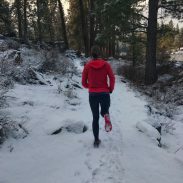 I felt the CIM’s net downhill toll on my quads with each and every step! So we simply stopped more frequently to enjoy the view. These photos do no justice to the incredible beauty and vastness of the Yosemite Valley. After our hike, we enjoyed lunch at the Yosemite Valley Lodge and then visited the Majestic Yosemite Lodge (formerly the Ahwahnee Lodge). The Majestic was beautifully decorated for Christmas. We left the park mid-afternoon, since we wanted to return to our hotel before sunset. Ryan and I both agreed we felt as if we had only scratched the surface of the wonders of Yosemite. We will most certainly be visiting this park again! Do you prefer to travel during the on-season or off-season? What places are high on your must-see travel list? Yosemite looks like an amazing place to visit! I cant believe you hiked there the day after your marathon. I couldn’t imagine doing that! But it definitely looks like it was worth it! It is such an amazing place! I think it was mind over matter with hiking, although I could not have made it farther than the 2 miles we hiked. One of the best trips I’ve taken was Rome and Florence in January. The number of tourists is in half, and it is chilly, but totally manageable. Lines are way shorter, and you don’t get accosted by all of the solicitors! 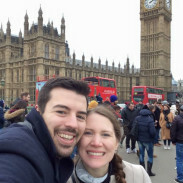 I went to Rome in December years ago and I agree – best time of year to visit there! It’s still pleasant weather (compared to say Germany that time of year, which was very cold!) and so nice not to have to stand in line for hours! Absolutely BEAUTIFUL. That waterfall is gorgeous. Isn’t it? And apparently there’s another that’s even more stunning! Ugh I’m so jealous! I definitely want to visit Yosemite as well as some of the other national parks. One dya! Definitely should be on your list for one day! Well worth the visit! WOW!! These pictures are gorgeous! it’s so beautiful! I am glad you finally got there!